Every Philadelphia recreational center is now equipped with a defibrillator– that’s 150 automated external defibrillator (AED) machines installed to help save lives. The devices were donated by the fire department and the installation began last November. Today, Fire Commissioner Ayers and Slawson announced the project at the Columbus Square Recreation Center in South Philadelphia. 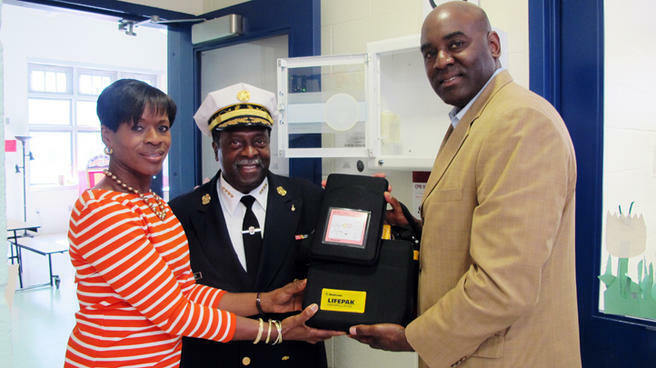 Prior to the fire department’s donation, there had been only 12 AEDs in the city’s recreation centers. Those machines were donated by the Daniel E. Rumph II Foundation to honor basketball player Danny Rumph who collapsed on a recreation center basketball court and went into sudden cardiac arrest after scoring a game winning basket. He died from hypertrophic cardiomyopathy. Rumph, a Western Kentucky University basketball star, died on Mother’s Day 8 years ago in the Germantown gym he grew up playing basketball in. The City of Philadelphia purchased the new defibrillators and transferred their current ones to each recreational center. According to Recreation Commissioner Susan Slawson, the defibrillators are valued at approximately $500,000. She praised the equipment transfer within the city. In addition to the devices being installed, 300 recreational center staff members across the city have been trained to do CPR and to use the AED device. “If you look at the (donated) machines, they look brand new,” said Ayers. Each AED machine has a new battery, case and has been tested for current use. The fire department’s new machines have additional technology for EMS personnel to take advantage of. They were paid for by the city, according to Ayers. “Survival rates decrease by 10 percent for each minute that goes by without CPR and a defibrillator,” said Danielle Main Haley of the Youth Heart Watch at the Children’s Hospital of Philadelphia. “The main thing is time is of the essence when these things occur. Someone can grab an AED right away and have a better change of saving that person’s life,” she said. “We are working through our tragedy and hurt. This is something that Danny would want us to do,” said Marcus Owens of the Daniel E. Rumph II Foundation and Danny’s uncle. The Daniel E. Rumph II Foundation is holding a golf tournament to raise additional funds for sudden cardiac arrest awareness. The group distributes symptom cards, produces an annual basketball tourney and raises general awareness around heart health. The golf classic takes place Sunday, June 20 at Springfield Country Club.